I know it is October and it is the perfect time to be doling out reviews on creepy movies in order to rack up those page views, but Paul Newman hasn't gotten any love on my blog at all I just won't stand for that any longer. Sad to say, but I only own three Paul Newman movies. I mean, back in the day I had Road to Perdition on VHS, but that's long gone. My parents have The Verdict and Butch Cassidy and the Sundance Kid and I do raid their films on occasion, but as far as my film collection goes I'm pretty sure I have just one more Newman movie than they do. Mine are Cool Hand Luke, Harper, and The Hustler. Naturally, The Hustler is going to be the subject of this review, but I will give this one company with a review of Harper at a later date. I think I probably saw The Hustler for the first time on Turner-Classic Movies. Maybe it was around seven or eight years ago. Maybe it was closer to ten. I didn't even see all of it, though. Not that first time. I think I only saw the final forty-five minutes or so. I didn't know the woman in the movie was Piper Laurie, but I recognized George C. Scott and Paul Newman right off the bat. George C. Scott has long since been one of my favorite actors and I've always thought that he never got as many good roles as he should have gotten. I'm not quite sure why, maybe it was his personality or just poor-decision-making or just his preference to performing in theater, but he never had but a few signature film roles to his name. I've always meant to delve a bit deeper into his film catalog, but I just haven't done so. 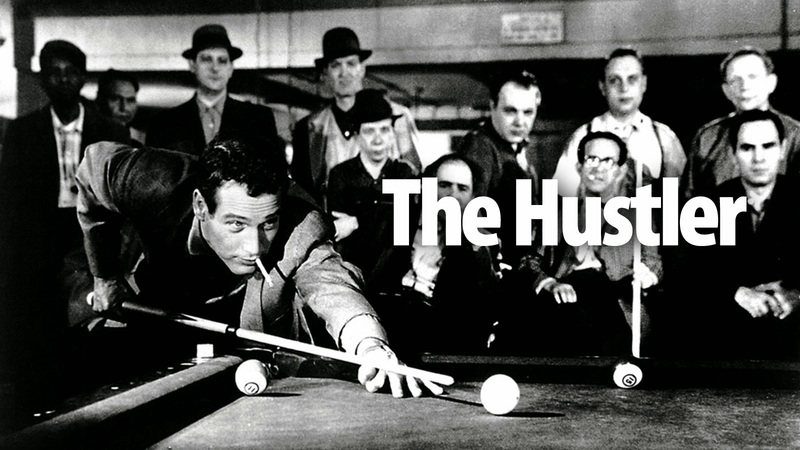 The Hustler is obviously one of George C. Scott's bigger films (yet certainly not the biggest) and it's also one of his bigger roles (not the biggest, either) even though he is largely in "supporting actor" mode. Bert Gordon is the perfect role George C. Scott because Scott does the sneering and devious types better than just about any actor. I mean that as nothing but a compliment. Jackie Gleason, certainly his biggest movie until 1977's Smokey and the Bandit, plays the infamous Minnesota Fats. Never heard of Minnesota Fats? Well, he's the best pool-player there is and Fast Eddie Felson (Paul Newman, of course) won't rest until he's made the fat man beg for mercy. This movie stuck with me for a long time and recently I decided to buy the blu-ray so I could watch the entire thing from the start. Despite really watching all of this movie for the first time I still feel like I've seen this film countless times. It's just stuck with me since the first time I saw just a part of it on TCM. The biggest reason for its impact on me, aside from the very good dialog and great all-around characterization, is Paul Newman's portrayal of Felson. Paul Newman went toe to toe with George C. Scott and seemed to steal most of the thunder from him. It's just an impressive performance from a guy that would have many more impressive performances under his belt in the years to come. One thing I also really loved about this movie was that it didn't have a huge cast of characters. Sometimes movies get too bogged down trying to include too many names and faces, but aside from Newman, Laurie, Gleason, and Scott there really aren't a lot of people in this movie. This is great because it gives the main characters a chance to really shine and grow as they interact. I just happen to love movies set on a smaller scale, too. They are much more immediate. Jackie Gleason probably gets the least amount of character development, but that's because he starts out as this mythical player Felson wants to play and then turns into just an everyday person who plays pool for money. I guess you could call that character "undevelopment," but it's genius because it shows just how much Eddie Felson has changed since his first match against Minnesota Fats. It's all because of Piper Laurie, too. She makes the movie just as much as Newman or Scott. I have never seen the sequel made 25 years later by Martin Scorsese that won Paul Newman his "sympathy" Oscar, but I can't imagine it can be as good as Robert Rossen's original even if Scorsese did direct it. And that's really saying something because Scorsese is one of the best in the business to this day. I loved this movie. If you haven't seen it you are a communist. A Geroge C Scott you should check out (if you can find it) is "The Hospital". It's a black comedy about a suicidal doctor. When I do those top 15 movies of all time lists, I usually find room for The Hustler. The look of the film is fantastic. You can almost smell the stale smoke and beer while you're watching it. The characters and dialog are top notch. You don't see many movies where the talented guy is a loser. I haven't seen it for a while - time to dust it off.